The submitted widget will be displayed with the tag [weather]. 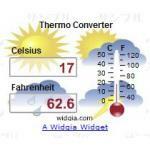 A great tool for those interested in weather. This widget shows the latest satellite images over Japan. The code is towards the bottom of the web page. You can also select a few other similar widgets.